Today I took a little time to conduct a bit of an experiment. 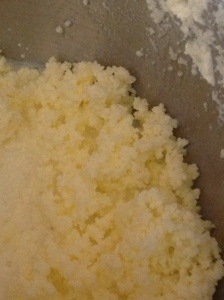 A little while back I wanted to see if the idea of making butter from cream at the homestead was a feasible idea. I think that it will work out to our benefit. To do this I started with a 16oz carton of heavy cream. The cost, about 3.00. 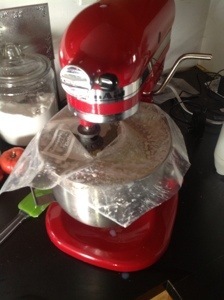 My weapon of choice, the wife’s stand mixer. 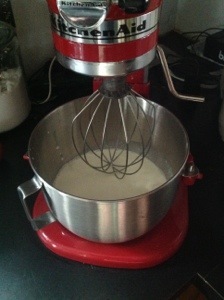 In went the cream, and on went the mixer. 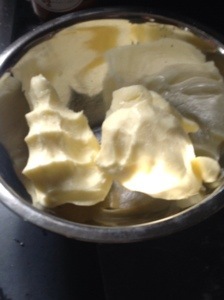 The whole process took about 10 minutes to actually achieve butter. At the photo to the right it is just about to break into butter, it kind of surprised me how quickly it broke. I made the rookie mistake of thinking “I can block the spatter with only my hands” as a reward I now smell of buttermilk, and I now know how to improvise a splatter guard for the stand mixer. With a couple more minutes of beating I was rewarded with what looks like bad buffet scrambled eggs. 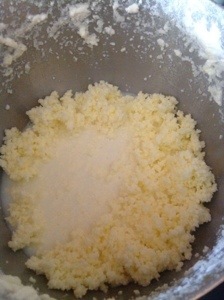 The next step was to drain off and SAVE the resulting buttermilk. This will become pancakes in the morning. Then it was off to washing the butter. 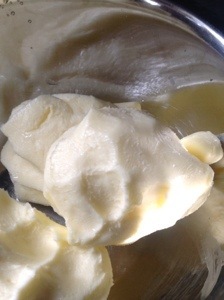 If you do not wash the butter it will go rancid due to the remaining butter milk that is inside. When I was gearing up to do this I read that ice cold water could be added to the mixing bowl and the butter mixed again to thoroughly wash it. 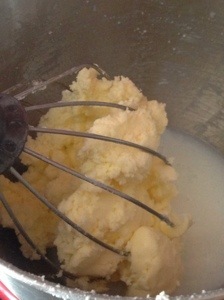 The result was more spatter and a ball of butter stuck in the mixer. What I think I will do with the next batch is to drain off the buttermilk and rinse the butter while it still resembles scrambled eggs in a fine mesh colander. In the final analysis this will be a bit more work but will save a bit of money. And while the cost savings may be only a couple cents, the memories made and time bonding with the kids multiplies that value infinitely. I also found a fun anomaly hidden within the cream. If anyone knows why this is I would love to know. Here it is. I started with a 16oz carton of cream. When the process was complete it yielded 12.9oz of butter, and 16oz of buttermilk…….sounds a bit like a hidden gift to me.